iPhone 3.0 has brought some fantastic new features that are well known like Cut, Copy & Paste. However some smaller tweaks have been made to the operating system that provide a better user experience. To me most of these changes effect Podcasts. For example you now have easy access to the speed controls and a 30 second skip-back button incase you missed something. 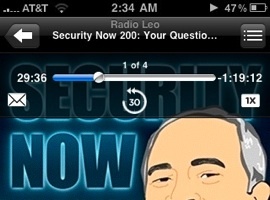 Fantastic for shows that go in-depth on specific topics like Security Now! Also seen in the screenshot is the little envelope icon. This button allows you to share current podcast with a friend via an iTunes Link. This does not work on podcasts not featured in the iTunes store, so if you’re subscribed to an RSS feed you are unable to share. The feature most important to me for daily use isn’t MMS, but the ability to quickly see the remaining battery life. My way around this was a little app called Free Memory, which has the auxiliary feature of telling you the battery life percentage. The app is still worth keeping around if you own an original iPhone or an iPhone 3G and for the ability to free some memory on your device. For iPhone 3GS owners, you now have a nice little option to show the battery life in the top tray of the iPhone. To access the battery life option, head over to your settings button on the iPhone home screen. From there tap General, then tap Usage, and there will be a slider button on the top. This option is turned off by default and hidden in a screen most people never make there way into. iPhone OS 3.0 has been great to me so far, but my big excitement is over the speed of the new 3GS which I was reluctant to pick up at first. A full review of my 16 GB 3GS White will be coming up soon. In the meantime, what features of the iPhone 3.0 update have proved useful to you? Updated: Added text to help clarify that the battery percentage feature is an iPhone 3GS only feature. Thanks to the astute folks in the comments for pointing this out. So I have only played with the iPhone 3G S for few hours, but one of the cool features I was looking forward to trying was the new Voice Control. Only one problem. I had trouble figuring out exactly how to make it work. In most cases I am usually able to figure out how new iPhone features work. For this feature, I had to get some help from Apple’s support site and the iPhone 3G S User Guide. To save you some time, here is how to get this feature up and running on your new iPhone 3G S along with the command you can use to make it go. If you want to consult the manual yourself, here is the link (PDF) from Apple’s support site. Press and hold the Home button on your iPhone or press and hold the center button on the iPhone headset. After a second or two the Voice Control interface should appear and you’ll hear a beep indicating it is ready for your command. Call a contact: Say “call” or “dial” plus the name of a person in your contacts to call that person. If they have multiple numbers the iPhone will prompt you for which number, i.e. “Home” or “mobile”. That’s it. I have to say the Voice Commands work pretty well right out of the box (at least with my “average” anglo saxon US voice). About my only complaints are that you have to constantly go in and out of Voice Command mode using the hold button technique described above and that the default voice is a bit tricky to understand at times. No OS X “Alex” here. That said it’s nice to have voice control on the iPhone (finally) and I look forward to get getting better in future updates. A podcast about all things Macintosh. For Mac geeks, by Mac geeks. Show 269. A show for Mac geeks, by Mac geeks. A special episode of the Maccast where I am joined by Victor Cajiao (Typical Mac User) to wrap up all the announcements from the 2009 WWDC keynote. We discuss the new Macbook Pro and Macbook Air models, Snow Leaoprd, iPhone OS 3.0, and the new iPhone 3Gs. Enjoy. Smile on My Mac, check out Textexpander and their blog. Join us for live Maccast Skype chat starting right now. We’ll have the conversation going now until the end of Apple’s live WWDC event which starts today (06/08) at 10:00 AM PT. We are using Skype this time because iChat rooms have a 35 person limit. If you have Skype already installed, use the link below to join If you don’t have Skype you can download it and use it for free at Skype.com. The Skype room limit is 150, so it will still be first come first served. See you there. Maccast WWDC Chat hosted by themaccast. A podcast about all things Macintosh. For Mac geeks, by Mac geeks. Show 268. Apple Store news and updates. Apple software updates galore. Next gen iPhones or it’s look-a-likes surface. On the eve of WWDC, last minute updates. Apple may nix free iPhone app re-downloads. WWDC iPhone rumor round-up. Apple extends warranty for Nvidia defects. Apple tops in UK Ed. Adjusting media playback speeds. Make your own widgets the easy way. What to do if you haven’t backed up. The ‘F’ and ‘fn’ keys. Fax from your Mac. Moving your Time Machine backup to a bigger drive. A note about Maccast WWDC coverage. Adam on Mac 20 Questions.